Planting the Seeds of Change: Tony’s keynote address will inspire conference attendees to plant the seeds of change in their own local communities by incorporating the assets that their communities already have. Anthony Geraci is a chef and Food Service Consultant and is the former Director of Food and Nutrition for Baltimore City Public Schools. Prior to his move to Baltimore he was the developer and Executive Director of First Course; a culinary training and job placement program for people who are developmentally disabled or recovering from substance abuse or mental illness. 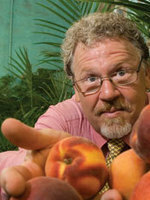 He has been an enthusiastic supporter, practitioner and architect of the National Farm-to-School movement. 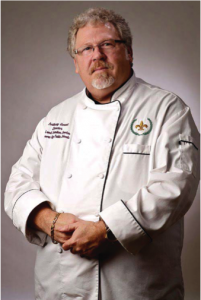 He is a native of New Orleans and a third generation restaurateur who did a traditionalapprenticeship with four-star hotels and restaurants throughout the U.S. More recently, he has worked with food service directors throughout the country; streamlining their operations for purchasing, introducing local products to their menus, and incorporating vocational training. He was also featured in the film “Angry Moms,” a documentary about the national school lunch program. He is the feature of a current film, “Cafeteria Man,” the story of the transformation of Baltimore City Public School’s lunch and breakfast program. His New Hampshire program was cited as a “Best Practices” example of one of the most innovative approaches to school nutrition in the nation. Tony’s work has been featured in Gourmet Magazine, The Atlantic, Urbanite, The Diane Rehm Show, the Food Network, The Washington Post and a host of other radio, print and television appearances. Tony arrived in Baltimore, in July 2008. In a remarkably short amount of time, Tony increased the breakfast participation in the public schools from 8,500 breakfasts served per day to more than 35,000. He is also the founder of “Great Kids Farm” – a city-owned, but abandoned, 33 acre farm which is now being used for vocational training and organic food production for Baltimore City’s schools and local restaurants. Tony’s focus in Baltimore was on nutrition and vocational training in the hospitality industry. Baltimore City Schools now source their fresh fruits and vegetables from Maryland farms – resulting in significant savings for the school system and increased revenue for the local farmers. Tony and his team also introduced an innovative 6 week menu cycle for the 2009-10 school year which includes “Meatless Mondays” which focuses on plant based school meals and provides an opportunity to have a conversation around cultural diversity. As a result of his innovations in Baltimore, Tony was voted by his peers as Foodservice Director Magazine’s “Foodservice Director of the Year” for 2009 after being featured in July 2009 as Foodservice Director of the Month. He has also been recognized as a community leader; Maryland’s Governor, Martin O’Malley awarded Tony the first “Smart, Green and Growing – Buy Local Agriculture” award for successfully incorporating fresh local foods into Baltimore’s cafeterias. Tony is now using his abundant energy, enthusiasm and expertise to assist school districts, food service providers, and corporations in their quest to provide better quality food to children in a fiscally responsible and accessible manner. Check out this recent “Cafeteria Man” article about Tony in Organic Connections Magazine! A liberal arts education is one that fosters new ways of thinking, creative problem solving, social awareness and engagement. Liberal arts institutions boast of academic rigor woven within diverse and well-integrated curricula. College farms can serve to support these advantages of a liberal arts education, while adding a hands’ on, living laboratory that puts students to work directly with their environment and their communities. Julia Barton recounts how her involvement with Dickinson’s student garden in conjunction with other sustainability and social justice groups and initiatives on campus helped to shape her academic and professional pursuits during and after her time at Dickinson College. 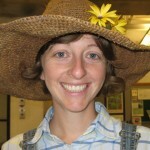 Julia Barton is a graduate of Dickinson College (2005) and an urban homesteader with her partner, Patrick Turner, and cat, purslane. Since her time at Dickinson, Julia has remained engaged in agriculture, managing a small farm and day program for adults with disabilities, then working with urban farmers and community gardeners to preserve urban gardens, create new gardens, and address land use and policy issues associated with urban agriculture. Julia completed her MS in Rural Sociology in 2010, during which she focused on agricultural economic development at the rural-urban interface, and collaborated with fellow students to found the Ohio State University Student Farm, which Patrick manages. She has recently begun an interdisciplinary PhD program in Environmental Sciences, which supports her work with Somali refugee women in an urban agriculture and empowerment project. Through a National Science Foundation grant, Julia teaches science in a rural, public school. Julia’s fourth grade students recently advocated the creation of a school garden when they became dissatisfied with the vegetable options provided in school breakfast and lunch. Garden plans are underway!